BROOKLYN, Mich. — For the first time this season—at a track where he was expected to contend—Denny Hamlin finally dodged the pitfalls that have plagued him in previous races and closed the deal. First out of the pits after a stop under caution on Lap 192 of 200, Hamlin held off Matt Kenseth after a restart with five laps left and claimed his first victory of the season in Sunday’s Heluva Good 400 at Michigan International Speedway. Hamlin, who won his 17th Sprint Cup race, crossed the finish line .281 seconds ahead of Kenseth. Unlike previous races at his best tracks, such as Martinsville, Richmond and Pocono—where Hamlin was strong early but succumbed to a variety late-race problems—Hamlin’s No. 11 Toyota was at its best in the closing laps of Sunday’s race. “We finished—that’s the thing,” Hamlin said in victory lane. “We got it done. Everyone knows that we’ve been strong. Today we didn’t look as strong as what we normally do here, but we got it working there at the end. 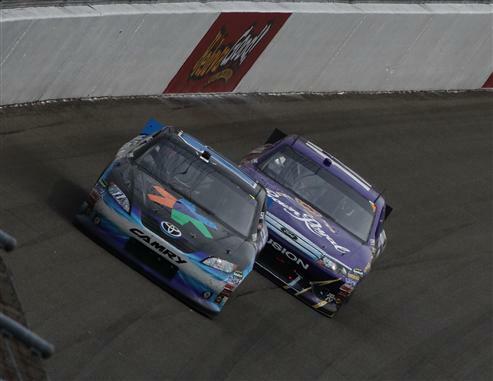 Kyle Busch, Hamlin’s teammate at Joe Gibbs Racing, finished third for the second week in a row. Paul Menard came home fourth for his best result of the season, and Carl Edwards finished fifth and expanded his lead in the series standings to 20 points over second-place Kevin Harvick (14th Sunday). Ryan Newman, Tony Stewart, Clint Bowyer, Mark Martin and Brian Vickers completed the top 10. Kenseth spun his tires on the final restart but got a push from Edwards, his Roush Fenway Racing teammate, and closed on Hamlin over the final five laps—but ran out of time. “I got a bad restart, and Carl pushed me back to clean air, which was real nice of him, and I got back to Denny, but I couldn’t get around him,” Kenseth said. “We were kind of slow for about 10 laps on most runs, and then it seemed like we were the best car from 10 (laps) until we needed fuel. The victory and third-place finish for the Gibbs cars were a welcome change from the start of the weekend. On Friday, NASCAR ordered all three JGR teams to replace oil pans that had not been submitted for approval. (JGR’s third driver, Joey Logano, finished 18th.) NASCAR is pondering sanctions for the unapproved parts, with an announcement expected early in the week. Hamlin cracked the top 10 in the Cup standings for the first time since the third week of the season at Las Vegas. The runner-up to Jimmie Johnson in last year’s Chase, Hamlin is ninth, 77 points behind Edwards with 11 races left before the field for the Chase for the NASCAR Sprint Cup is set. Hamlin got the opportunity he needed when a caution on Lap 158—the result of an accident involving Juan Pablo Montoya and Andy Lally in Turn 4—interrupted a cycle of green-flag pit stops and scrambled the running order for a restart on Lap 164. Edwards passed Kenseth and Busch for the lead on the restart lap, with Hamlin in pursuit. With the top-10 drivers in fuel-saving mode, Edwards continued to pace the field, pulling away from Hamlin by a second and a half, before contact from Hendrick Motorsports teammate Mark Martin sent Dale Earnhardt Jr. into the Turn 1 wall to bring out the final caution. On Lap 192, when the lead-lap cars came to the pits—most for two tires and fuel—Hamlin’s crew executed its best stop when it counted most. Johnson continued to have problems with Michigan, one of four active Cup tracks where the five-time defending champion hasn’t won a race. Johnson spun off Turn 2 just eight laps into the race, flattened three of his four tires and broke the sway bar on the No. 48 Chevrolet. Ultimately, Johnson lost two laps as his crew repaired the car. He salvaged a 27th-place finish but lost most of the ground in the standings he had gained on Edwards last week at Pocono. Johnson fell from second, six points back, to fifth, 29 points in arrears.